The Holidays are nearing a close and the New Year is fast approaching. Some are eager to approach this New Year, with their resolutions steady in their minds. 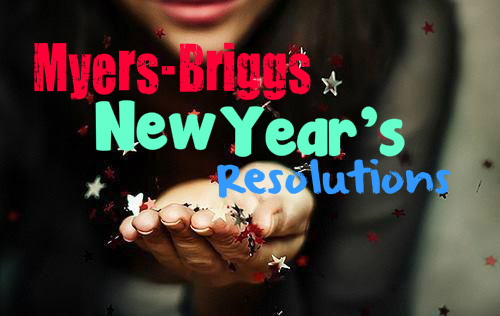 So we present you with the best New Year’s Resolution for each Myers-Briggs personality type. INFJs tend to be hard on others but even harder on themselves. It is important for INFJs to remember that they are not perfect and that everyone makes mistakes. They may struggle with forgiving others when they hurt them, but INFJs often have an even harder time forgiving themselves. Going into the New Year it is important for the INFJ to learn to forgive themselves and accept their own flaws. Welcoming mistakes as a part of life and learning from those errors, is the best way to grow as a person. For the INFJ who does so much for others, forgiveness can be a challenge. They often want to care for others, fearing when they make mistakes. It is important for the INFJ to give themselves credit where they deserve it, and to let go when they aren’t as perfect as they want to be. ENFJs have a tendency to take on the needs of everyone around them. This desire to care for others can sometimes lead to them forgetting about themselves. Going into the New Year, it is important for the ENFJ to take some time for themselves. Learning that it is perfectly acceptable to relax once in a while is something that the ENFJ could benefit from. ENFJs are incredibly caring individuals, who strive to help everyone around them. They often are so busy caring for everyone and getting important things done, that they forget to relax. It is important for the ENFJ to take some time to just relax and let go of their stress. INFPs are often very warm and affectionate individuals. They have a way of appreciating other people and strive to be honest in every aspect of their lives. This often makes the INFP wonderful companions, making people want to draw closer to them. Although INFPs are warm and caring, they can often be harder on themselves than anyone realizes. A great resolution for the INFP going into the New Year is to learn to love themselves more. The INFP needs to learn to accept their own imperfections and to love themselves for the amazing individuals that they are. It is time to see yourself the way that others see you, and to learn to truly love yourself like never before. ENFPs are often very enthusiastic and eager individuals, who love to soak up everything around them. They enjoy being able to learn and grow, and seem to constantly be thinking about a million things at once. It is important to take a step back and relax once in a while, allowing yourself to be free from worry. ENFPs seem entirely carefree, but their minds are often running faster than anyone can truly see. It is important for them to take a step back and breathe, without constantly needing stimulation from the world around them. Appreciating what they have and just how wonderful their lives are in that present moment, is something that the ENFP could benefit from going into the New Year. INTJs are driven and intelligent individuals, who strive to always be learning and absorbing information. They enjoy being prepared and reaching a deeper understanding of everything around them. For INTJs it can often be a struggle to appreciate the present moment, since they are often more focused on the future than the present. Going into the New Year it is important for the INTJ to work on living in the moment. Living in the present and appreciating everything that the world around them has to offer, is a wonderful goal for the INTJ. Learn to enjoy your surroundings and take a moment to breathe it all in. Allow yourself time to express your creative side as well, since that is an important side to the INTJ. ENTJs are extremely driven and strategic individuals. They enjoy being able to maintain control of their surroundings, wanting to keep everything together around them. ENTJs are excellent at strategically planning a way to reach their goals, but this often makes them overwork themselves. It is important for the ENTJ to let go once in a while and learn to control less. Going into the New Year, it could benefit ENTJs to learn to accept some things the way that they are. We strongly believe in their ability to influence their surroundings, but sometimes it is okay to let things happen on their own. It would be good for the ENTJ to learn where to let go and stop trying to direct a situation to their will. INTPs are intensely intelligent and precise individuals, with an ongoing thirst for knowledge that can never truly be sated. These qualities are part of what makes the INTP amazing and dynamic, but it also can be hard for them to shut their minds off. It is important for the INTP to learn to let go sometimes, finding ways to keep their minds busy on one thing at a time. It is good for the INTP to grant themselves time to relax and just take in the moment that they are living in. It can be challenging for INTPs to experience the present moment, since they are often ten steps ahead. But regardless it is very important to learn how to live in the present, especially for an INTP. ENTPs are charismatic and dynamic individuals who have a way of making others want to be around them. They are intelligent and social people, but can sometimes be very skeptical and untrusting of others. It is important for ENTPs to remember that everyone is human and people make mistakes, but that those mistakes are not always maliciously done. Learning to trust more and let go of their more cynical side, can truly help the ENTP move forward in their lives. Sometimes that lack of trust can hold you back, so learning to let go can help you grow more as an individual. ISFJs are very warm and giving individuals, who are always willing to help the people around them. ISFJs can sometimes struggle with trying to balance everything around them, wanting to make sure that everyone is taken care of. This is a wonderful quality, but it can cause the ISFJ more stress than necessary. Going into the New Year it could be helpful for the ISFJ to learn to let go more. Learning where they can relax and allow others to take care of themselves, is very important for an ISFJ. It is important for the ISFJ to stop worrying so much about everything in their lives and others lives as well. ESFJs are very giving and consciousness individuals who strive to make others happy. ESFJs often spend most of their time tending to the needs of others which can make them forget about themselves entirely. It is important for ESFJs to set proper boundaries and learn when it is time to take care of themselves. ESFJs can often neglect their own needs completely, worrying so much about taking care of others. A great resolution for ESFJs going into the New Year, is simply to take care of themselves more. The world will not fall apart if the ESFJ is not holding it up, it is important for them to remember that. ESFJs do a lot for others and it is more than fair for them to take care of their own needs as well. ISTJs are dutiful and hard-working individuals, often doing the work that no one else wants to do. They always get the job done to their own high standards and simply want to be appreciated for what they do. Although ISTJs work very hard to make sure that they fulfill their necessary duties, it is important to take some time to enjoy the moment as well. Learning to laugh more and take in the joys of life, is something that the ISTJ could benefit from greatly. ESTJs are dutiful individuals who enjoy being a part of a community. They work very hard to make sure that the practical needs of their family and loved ones are met. Sometimes ESTJs can focus too much on what needs to be done, rather than learning to appreciate what has already been accomplished. Going into the New Year, it is important for ESTJs to commend themselves for all of the good things that they do, as well as commending others for their good deeds. Learning to give credit when needed is an important thing that the ESTJ would do well to remember. ISFPs are caring and free-spirited individuals, who are very in touch with their own emotions. Although ISFPs can be very forgiving of other people’s flaws, they can sometimes be too hard on themselves. They can sometimes take other people’s criticism very harshly and may become hurt by the coldness of others. Going into the New Year the ISFP could do well to appreciate and love themselves even more. Learning to love themselves for the amazing people that they are, so that they can better brush off the criticism of others. ESFPs are very fun and entertaining individuals, who know just how to have a good time. ESFPs are often very focused on making sure that everyone around them is having a good time. They are willing to make a fool of themselves, simply to make sure that everyone is smiling. They are very caring individuals, who just want to make the world a more enjoyable place. Going into the New Year, is could be good for the ESFP to learn to take a step back once in a while. They do not always have to be keeping everyone entertained and may even appreciate allowing others to entertain them. ISTP are very intelligent individuals, with a strong understanding of how things work. They can be rather introverted, preferring to keep to themselves most of the time. Although they are well-liked by others, ISTPs can often keep themselves guarded. Going into the New Year, is would be good for the ISTP to open up more to others. It may be a struggle at first, but in the end it will be worth it. As an ISTP it could be good to make some time to show the people in your life that you care for them. Letting them in, is a great way to show them what they mean to you. ESTPs are outgoing and charismatic individuals, who enjoy seeking out intense new thrills. They enjoy being on the go and taking in the excitement that the world has to offer. ESTPs often do not like to sit still, hating feeling stagnant for too long. Although it may be a struggle, ESTPs could benefit from taking some time to be still and relax more often. Learning when to relax and enjoy the calmness of the moment can help the ESTP appreciate things more. Although ESTPs strongly enjoy living life to the fullest, there is much to be said about someone who can learn to enjoy the stillness as well.